Ready or not, the holiday season is upon us. 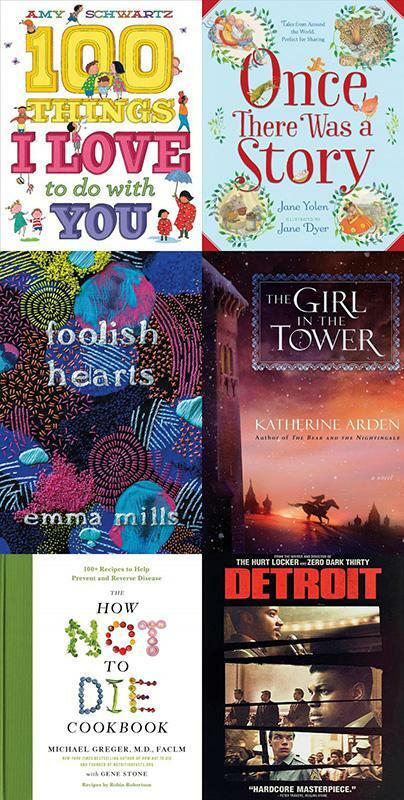 Keep your cool with some fun and escapist fiction titles for all ages, coming to neighborhood libraries in December. On the more serious side, may we also suggest a cookbook of healthy recipes that may help you live longer, and a movie and its accompanying soundtrack about an incident during the 1967 Detroit riots? We hope you enjoy these recommended titles and look forward to recommending more titles to you in the New Year! Can’t think of anything to do? With detailed, playful illustrations and easy-to-read, fun rhyming text, this book is full of ideas that little ones can do together with friends and family, old and young, to have a jolly good time. This is an illustrated collection of over 30 stories, fables, folk tales, and fairy tales from around the world. Some are old favorites, while others are lesser known. Perfect for cozy winter storytimes or bedtimes. Includes two original stories by Jane Yolen. Forced to participate in her school’s production of A Midsummer Night’s Dream, Claudia learns that putting yourself out there can lead to new friendships with former enemies and maybe even a little romance. A fast, fun read for fans of backstage drama and complicated characters. From Michael Greger, the physician behind the website nutritionfacts.org and author of the popular book How Not To Die, this cookbook puts science into practice. Includes recipes for 10 healthy flavor-makers that are used in the recipes to enhance flavor without the use of sodium. This fact-based dramatization of a tragic chapter from America's past draws disturbing parallels to the present. Set in 1967, a police raid results in one of the largest race riots in United States history, when a group of rogue police officers responds to a complaint with retribution rather than justice on their minds. The story is centered on the Algiers Motel incident, which occurred in Detroit, Michigan on July 25, 1967, during the racially charged 12th Street Riot. It resulted in the death of three black men and the brutal beatings of nine other people—seven black men and two white women—and lead to the federalization of the Michigan National Guard. Featuring music by The Roots, John Coltrane, Martha Reeves & The Vandellas, Marvin Gaye & Tammy Terrell, The Dramatics, James Newton Howard, Jerry Williams, Lee Rogers, and more. The powerful light of the Motor City, even in one of its darkest chapters, shines on a soundtrack that features some of the immortal sounds of Motown. Check out one of these new titles that will appear in neighborhood libraries and our online catalog in December. You used to sell Christmas cards that were exceptional. Do you do this any longer? Add a Comment to New Titles Coming to the Free Library in December!